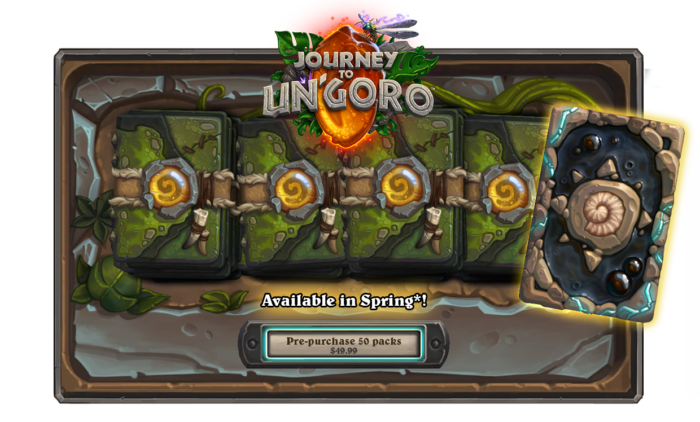 Blizzard has announced the latest expansion pack for Hearthstone, called Journey to Un’Goro, which launches in “early April” and begins the Year of the Mammoth. The expansion brings 135 new cards to the game. A small selection of these cards have been revealed, including the five-mana Shaman card Volcano, which randomly deals 15 damage split between all minions. Play Volcano to do maximum damage across the board. There is also the Mage’s Pyros, which starts at a two-mana 2/2 card that returns to your deck when it dies and repeatedly gets stronger, (after it’s first death it comes back as a 6 Mana 6/6) but more costly. Additional cards will be revealed on March 17th. Blizzard noted that some “familiar faces” will be added to the new Elemental type, while a new Adapt keyword is being introduced. This “allows a minion to become infused with elemental power, granting it new properties.” When you play an Adapt card, you are able to choose from three different buffs from the minion, with ten total buffs in all. One example is Awaken the Makers: this gives the player the task of summoning seven Deathrattle cards. Once you do so, you will obtain Amara, Warden of Hope, a five-mana 8/8 card with Taunt that has a Battlecry that sets your hero’s health to 40. Preorders for Un’Goro open tomorrow, allowing you to purchase 50 card packs from it for $50. If you do this you also get the Fossil card pack.